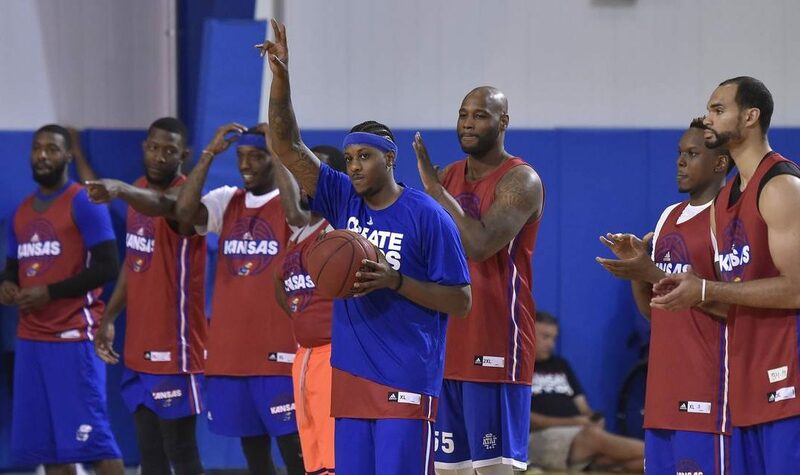 Ten-year NBA veteran Mario Chalmers has been playing basketball almost non-stop since sitting out the 2016-17 season, one in which he healed his ruptured right Achilles tendon. Chalmers, the 32-year-old former KU combo guard who is best known for winning an NCAA title at Kansas (2008) and then two NBA championships with the Miami Heat (2012 and ’13), averaged 7.7 points across 66 games for the Memphis Grizzlies last season — for him a completely healthy season. Since the end of that 2017-18 campaign, one in which he averaged 21.5 minutes per game, the 6-foot-2, 190-pound Chalmers has been competing in pro-am leagues in both Miami and Houston. The Grizzlies recently renounced his rights, meaning he is a free agent. “I’m very proud. A lot of people don’t really come back from that injury,” Chalmers said Friday at Lawrence’s Schwegler Elementary School where his Mario V. Chalmers Foundation sponsored a “field day” for the Boys and Girls Club of Lawrence. The Foundation will also hold a bowling event Saturday and golf tournament Monday. Chalmers — who has averaged 8.9 points (on 41.7 percent shooting, 35.1 percent from three), 3.7 assists and 2.5 rebounds in his pro career — said he’s confident he’ll play at the highest level at least three or four more seasons. “I know I’ll be on a team next year. I’m not worried about that part,” Chalmers said. “I am still going, waiting on a contract right now. I’m right here, handling my event this time of year. I’ll figure my next move after that. Chalmers believes he has a lot to offer as either a starter or reserve point guard. The book, which is illustrated by Emmanuel Everett, is available on Amazon.com. Chalmers will have several book signings in coming days with proceeds to benefit his foundation as well as launch the #READWITHRIO children’s literacy initiative. He will sign books 11 a.m.-1 p.m. Saturday at Crown Automotive, 3430 S. Iowa St. in Lawrence; 2-4 p.m. on Sunday at Johnny’s Tavern in the Power and Light District, 1310 Grand Blvd. ; Tuesday at 5:30-7:30 p.m. at Barnes & Noble, 6130 SW 17th St., Topeka; and July 28 from 11:30 a.m.-1 p.m. at Kansas Sampler on Quivira Road across from Oak Park Mall in Overland Park. Chalmers — whose bowling event on Saturday in Lawrence also benefits Boys and Girls Club of Lawrence — said he enjoys working with that organization. He said he seems to meet KU fans wherever he goes. His three-pointer, of course, sent the 2008 NCAA title game against Memphis into overtime. KU went on to win the game 75-68.